Samsung's Gear VR is one of a number of devices to have helped thrust virtual reality into the fore. 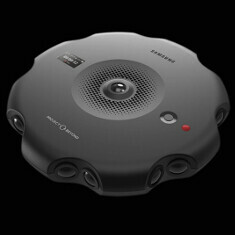 As part of this movement, the Galaxy maker has already showcased Project Beyond, a 360-degree camera that could be used by developers to create experiences for the Gear VR. Last month, Samsung trademarked the name 'Gear 360' in its native South Korea, and at around the same time, rumor suggested that a consumer-focused 360-degree shooter might be in the offing. Now, the folks at SamMobile have been informed that the device is indeed real, and that it will be showcased alongside the Galaxy S7 duo at MWC later on this month. The report doesn't reveal every key detail, but does offer a solid idea of what to expect. Described as a "compact spherical camera", the Gear 360 achieves 360-degree imagery by virtue of 180-degree fisheye lenses. Through Bluetooth and a supplementary Gear 360 Connect app, the device will certainly operate with the Galaxy S7 line, and could potentially offer support to recent, top-end handsets like the Note 5. The experience includes a Gallery app as well as a viewfinder, which packs a slew of controls like HDR, ISO settings and the like. Users can film in full 360 degrees at a maximum resolution of 1920 x 3840, or at 180 degrees from either of the two cameras at <1920 x 1920. A live feed of the camera can be beamed back to the connected handset, although it's unclear, at this stage, whether live streaming to other devices is part of the package. The camera includes its own battery and on-board storage, though the capacities of either have yet to be established. There's also no word on the price at this moment. Considering the accessible ($99) cost of the Gear VR versus comparable devices, one can only hope that the Gear 360 will follow a similar trend, and if Samsung does intend to throw some weight behind the Gear 360, it may also be bundled at a cut price with the Galaxy S7. Since we can be fairly sure that the Galaxy S7 and S7 edge won't appear remarkably different from their respective predecessors, it makes sense for Samsung to have a few trump cards up its sleeve. If the Gear 360 is anywhere near as cool as it sounds, the company could be onto a winner. Hopefully more details, as well as some images of the Gear 360, will manifest themselves in the near future. The future is here. I can't wait to play a game on vr. Me too. VR is the future. Remember, it wouldn't be revolutionary and futuristic VR product till Apple introduces it as iView. Indeed. And it would be more painful if we wear tight jeans. Sounds great! I love how Samsung is always spending huge amounts of money on researching new and existing technologies. They might try too hard to always try to counteract what Apple does, but they are a true leader in my book. A startup had this exact camera at CES. CES was 3 weeks ago I'm and curious if that startup is ready to hit the market with their device. Either way, I'm sure we'll find out that Steve Jobs had a team working on it 20 years ago. Steve Jobs seems to be the 2Pac of technology. I can see the price of this being around $600. It's for developers...not consumers so a higher price point is expected. Am I missing something here? This does not appear to capture stereoscopic imagery. So, not very useful for VR. The head-tracking is nice, but you are basically just looking at flat imagery projected onto the inside of a cylinder. It has a top mounted camera as well from the looks of it. It will still be awesome compared to looking at flat imagery centered on a small screen. I'd rather have 360 panoramas from places I visit than small photos. Had the same product been made by Apple, All the media and some cartoons would be shouting top of their voice that a revolutionary product is being invented by Apple. Alas the truth is Apple is a dead Technology company where noting is invented any more, now they are good follower only. Don't worry, soon Apple will release a version and then the Verge, PA and all other corrupt Apple blogs will shout how revolutionary it is and Apple will sue Samsung. The next logical step for Samsung. By the time the $2 Billion investment by Facebook yields Oculus products, these guys will be a hundred miles down the road and have captured the market. This should be used as a case in "Time to Market" in the business schools.